Three weeks ago I published a piece on why people should start feeling good about Temple‘s chances to make noise this season. The Owls responded to my bold proclamation by losing to a mediocre St. Joseph’s team on that very same day and getting pasted by 23 points on the road against an admittedly excellent Villanova team. The results didn’t necessarily prove that I was an idiot for hyping Temple, but it didn’t exactly make me feel good about going out on that limb either. Today I am feeling much better after watching the Owls absolutely drub a Kansas team by 25 points that entered the game with one of the most impressive non-conference resumes of anyone in the country. On the surface, the outcome was a huge surprise as a usually efficient Jayhawks’ offense was bogged down by turnovers and missed jump shots. But the Owls have quietly been sneaking up KenPom’s team ratings and have pushed themselves squarely into the conference title discussion with conference play right around the corner. Casual college basketball fans may view the Owls’ victory Monday night as a stunning upset and it was, but the college basketball fans who have been paying close attention this season likely knew the Owls had more than a puncher’s chance of taking down the mighty Jayhawks in Philadelphia and here is why. 1. Temple made more than half of their two-point baskets. 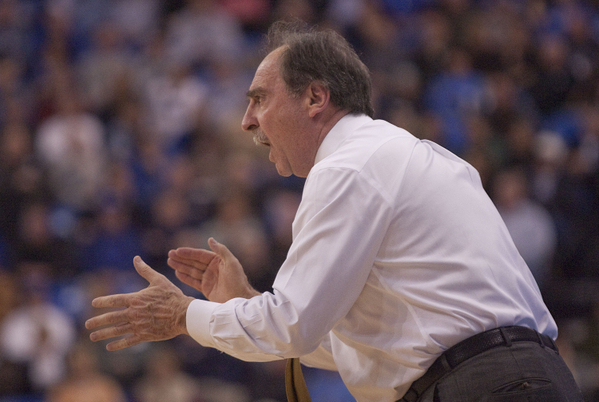 It’s no secret that Fran Dunphy‘s club has been bricking shots at a frightening rate this season. Even after last night’s show, the team is still shooting just 42.9 percent on its two-point shots this season — good for 294th in the country and nearly five percentage points worse than the 47.6 percent that serves as the national average. Volume-scoring guards Will Cummings and Quenton DeCosey have been primarily to blame for this unsightly mark. They use the majority of the team’s possessions and take most of the team’s shots as well, which is unfortunate, because both players are still shooting under 40 percent on two-point field goals for the season. Monday night was a different story however. The Owls made 21-of-28 two-pointers (75 percent) and both Cummings (3-of-5 from inside the arc) and DeCosey (6-of-7 from inside the arc) played under control and allowed other players on the roster to shoulder some of the offensive burden as well. DeCosey and Cummings are still the team’s best and most important offensive players but they have often tried to do too much offensively, especially against good teams. Last night they led the team in scoring again, but they also patiently looked for good shots and got to the free-throw consistently, which put a lot of pressure on the Jayhawks’ defense and the unit was obviously unable to respond. The bad news is that it will be virtually impossible for the Owls to shoot the ball like they did last night again this season. They are a better offensive team than they have shown, but they aren’t THAT good. That said, if Cummings and DeCosey can settle down offensively and other players can chip in, Temple will continue to see its shooting percentages rise to a more respectable rate. Sometimes it can feel like Temple is the forgotten team in the AAC, and in some ways, it is a bit of an outsider. The Owls are the only basketball program that isn’t left over from the Big East or recently added from Conference USA, and because the basketball program has been decidedly “mid-major” since the John Chaney days in the mid-1980s, Temple doesn’t seem to fit neatly into either the “football” or “basketball” profile. Instead, the Owls serve as a bridge between the conference’s basketball standard-bearers and its bottom-feeders. A program that’s not quite good enough to receive the sort of attention that UConn and Memphis receive on the national level, but also a program much too good for college basketball enthusiasts to ignore. They are, however, worth paying attention to this season because as the conference has devolved into a mire of early mediocrity, the Owls have seemingly put last season’s 9-22 campaign behind them. 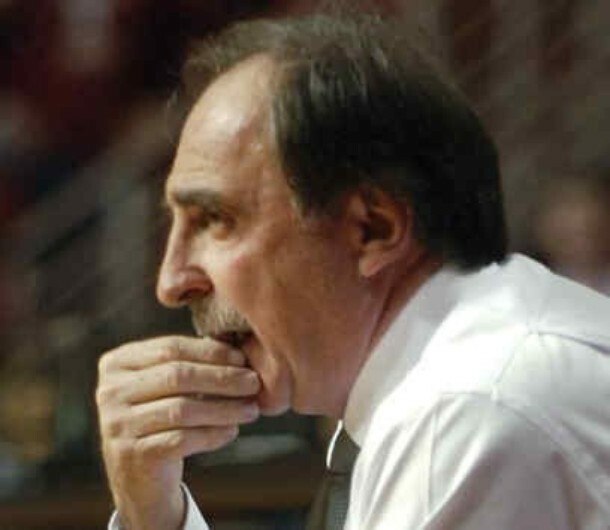 Now, they aren’t all the way back, as evidenced by a blowout loss to Duke and a disappointing follow-up loss to UNLV, but they are obviously much improved and with head coach Fran Dunphy steering the ship, Owls’ fans should be feeling better about the state of the program. Temple remains under the radar this season and that makes a lot of sense, primarily because the Owls didn’t make a great first impression by scoring only 40 points in a season-opening win against American, and also because it hasn’t beaten anyone of note yet (although Louisiana Tech is pretty good). But in what is rapidly becoming a wide-open conference with more and more questions by the week, there are a few reasons folks should be higher on the Owls’ prospects this season than they currently are. 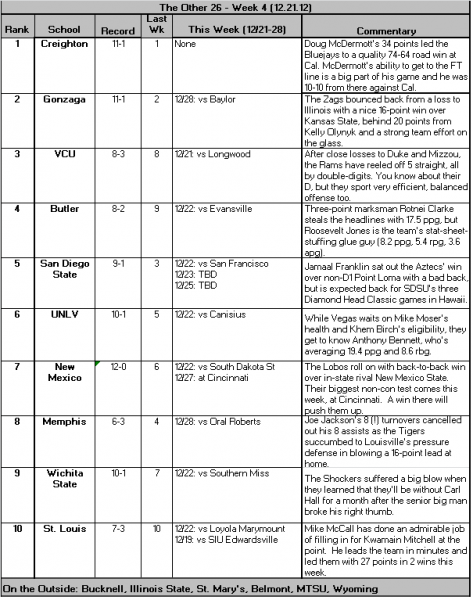 Yesterday was the AAC media day and the conference released its preseason coaches poll. UConn narrowly edged SMU as the preseason favorite, with six coaches picking the Huskies atop the league and the other five picking the Mustangs. Many other pundits expect a deep and talented SMU team to win the league running away, but it’s not really worth quibbling over when it’s clear the league coaches view the two teams as near-equal. For those who still want to pick nits, start with pointing out that somehow Cincinnati is ranked ahead of a loaded Tulsa team, and maybe while you are at it, casually mention that its awfully ambitious to pick South Florida to finish ahead of anybody this season. SMU coach Larry Brown got to reprise his role as the league’s preeminent grumpy old man yesterday when he argued with his fellow coaches about potentially shortening the college shot clock to 24 seconds. Nearly every other coach in the league — from Memphis‘ Josh Pastner to Houston‘s Kelvin Sampson and even South Florida‘s Orlando Antigua — argued in favor of a shorter shot clock. But Brown refused to go quietly, poking his colleagues with his witty one-liners and argument that the college game “will get ugly” with a shorter shot clock. The other coaches all argue that a shorter shot clock will lead to more possessions, more excitement, and more tempo, all of which would admittedly be nice to see in the college game. But apparently we will all need to go through Larry Brown, who also suggested getting rid of the three-point shot and making layups worth three points, if we want the shot clock shortened. Get in line now, because the 74-year-old seems to be mighty feisty with the season around the corner. Some of the more interesting AAC news came via Twitter this morning when college hoops reporter Adam Zagoria tweeted that former UMass and now Temple guard Jesse Morgan has only one semester of eligibility left and still hasn’t decided whether he will play the first or second semester. One semester left and it’s TBD whether he will play the 1st or 2nd semester this year. This can’t be the first time a decision like this came about, but I wouldn’t even know where to begin researching previous instances. In fact, until Zagoria tweeted it, I had no idea this sort of decision was even a thing. The decision is a big one for both Morgan, who likely doesn’t have an NBA future, and Temple, which could use Morgan’s scoring punch. However, it doesn’t seem like a particularly tough decision. Another team reporter pointed out that if Morgan chooses the second semester option, he would be eligible in December and would only miss 10 games. The second semester option would also allow Morgan to play in the postseason should Temple make it back to the NCAA Tournament. It seems unlikely Morgan will choose the first semester option, but the decision is still worth highlighting because of just how rare it is. 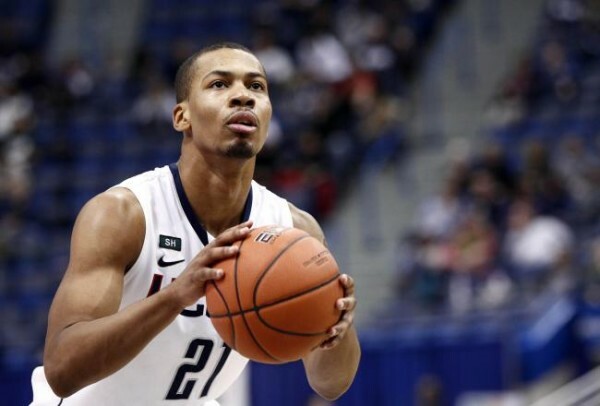 UConn will have one less option to try and replace Shabazz Napier, at least for the start of the season, as junior guard Omar Calhoun suffered an MCL sprain that will keep him out of action for at least a week. It’s totally possible that Calhoun will be back by the time the games start to count, but it can’t be the way that Calhoun or the Huskies wanted to start the season. The New York native has been something of a disappoint in his first two seasons in Storrs, but he reportedly looked very good this summer and was expected to be a key part of the backcourt rotation charged with replacing Napier’s production. Calhoun hasn’t really ever been entirely healthy in his time with the Huskies, so the hope is that the MCL sprain is minor and won’t linger, because the junior could use some good luck when it comes to his health. Our good friends at The UConn Blog threw the spotlight on probably the only potential member of the Huskies’ backcourt rotation who hasn’t been talked about yet — sophomore point guard Terrence Samuel. Some may remember Samuel has a crucial piece of the Huskies’ tournament run, even if his contributions did come in limited minutes. Probably very few remember Samuel from the regular season because coach Kevin Ollie barely played the freshman and when Samuel did play, it was usually once the game’s outcome had already been decided. The problem is that while last season’s backcourt was tough to crack because Napier hardly ever sat, this season’s rotation may be equally tough to crack because Ollie has way more intriguing pieces to work with. Early prediction: Samuel will emerge as a steady backup point guard and meaningful contributor by the time the Huskies end non-conference play. Although we aren’t even halfway through the conference schedule, the herd of NCAA Tournament contenders has thinned considerably and there are some teams whose prospects of playing in any meaningful postseason tournament are already dead in the water. We are gathered here today to celebrate their brief turn in the conference conversation. Why are we mourning Temple? The Owls beat Rutgers at home on Wednesday, but unfortunately it was also their first conference win in eight tries and the Scarlet Knights have more than one foot in the proverbial grave too. The team that was picked by the conference coaches to finish fifth currently sits in last place and has limped to a 6-13 start to the season. There is talent here and the team has been competitive against good opponents like Texas and Cincinnati, but their best win came in early December when they beat a mediocre Saint Joseph’s team at home, and they still have to play Villanova, SMU twice, and Louisville twice. Short of a miraculous AAC Tournament run, there is quite literally no hope for the Owls to make the NCAA Tournament or even the NIT, and it would take a strong finish for them to play their way into the CBI, something no team should enjoy being said about them. Yesterday morning we said that we did not expect Luke Martinez to get a significant punishment since charges were only brought against him once additional information about the case came out. Well we were wrong as the additional information that came out suggests that Martinez kicked his possibly unconscious victim’s face “like it was a football”. As if things were not bad enough for Wyoming at least two other players were present including one (Derek Cooke Jr.) who reportedly punched the victim before Martinez kicked him. We would not expect to see Martinez donning a Wyoming uniform any time soon if at all. Massachusetts faced an uphill battle in a strong Atlantic 10 this year, but appeared to be making a push for the NCAA Tournament, but those hopes took a hit when it was announced that Jesse Morgan will miss the rest of the season after tearing the ACL in his right knee last week. After the injury was initially diagnosed as a sprain, the Minutemen had hoped that he would return, but once Morgan was seen by a doctor on Tuesday it became apparent that it was in fact an ACL tear. At this point, a NCAA Tournament appearance seems like a stretch as Morgan is not only the the team’s second leading scorer, but also their best perimeter defender. With a fairly deep Atlantic 10, the Minutemen are probably looking at a NIT appearance at best unless they can get someone to step up to provide additional scoring and perimeter defense. We have seen a lot of weird stats when it comes to free throws, but never anything quite like what is going on with Wisconsin’s Ryan Evans, who has gone from a 73% shooter last year to a 38% shooter this year. Ken Pomeroy offers a variety of suggestions, but is not able to pinpoint a single identifiable reason. Looking through Evans’ game log from this season, it is apparent that a few atrocious games are having a large effect on his overall percentage, which is interesting because Evans has never had any poor performances from the free throw line during his three previous seasons at Wisconsin. It will be interesting to follow this trend and whether Evans is able to revert to his old form or if this becomes an issue for the Badgers who may be hesitant to use Evans in late game situations for fear that opponents will foul him intentionally to get him to the free throw line. You won’t see Tom Izzo on Twitter any time soon as he appears to dislike it and other social media because of the negative feedback that some of his players get although he lets them have accounts on it. [Ed. Note: He appears to have an account that he has not used in nearly two years.] It is interesting to see that some of the players have followed his lead and stopped checking out Twitter or other social media sites. On the other hand, there are several that appear to use it as motivation, which is what we typically see from players who love to retweet hate messages that are sent their way. While each coach has to make a decision that is best for the program, Izzo’s approach appears to be among the more sensible ones that we have seen–telling his players that they can use Twitter and other social media if they want, but to be ready to either ignore or deal with anything they hear on there. Andy Glockner is back with his latest bracket projection that includes the most tantalizing First Four game ever–Kentucky-North Carolina (a rematch of what was perhaps the best game of last season)–although at this point we would question if either team is even worthy of making the First Four. 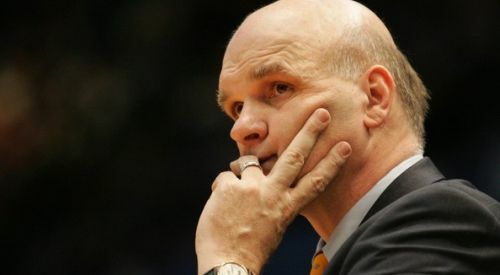 At least that was our initial thought until we started going through his Bracket Watch column where it became apparent how weak the resumes of some of the other Bubble teams are at this point. After looking at it one thing that we had been considering recently becomes apparent: some of the non-BCS conferences have a very good shot at getting more teams into the NCAA Tournament than they ever have before thanks to some of the BCS conferences having down years. When the A-10 added Butler and VCU to its ranks this past offseason, we knew that the two teams would strengthen the now 16-team conference. The two schools, each of which has had recent improbable Final Four runs, were expected to join the ranks of Xavier, Temple, St. Louis, and Dayton, and, along with a resurgent St. Joseph’s, UMass, and LaSalle, make the A-10 the deepest and, arguably, most exciting non-BCS conference in the country. But after the past week, it’s become clear that not only are these two programs going to add depth to the A-10, they may very well conquer it in their first year. By now you know that Butler took down top-ranked Indiana 88-86 in a thrilling overtime win last Saturday. What was most surprising about the win, though, was how Butler did it. It wasn’t their vaunted defense, which gave up 1.13 points per possession to Indiana’s full-throttled attack — the second most this year for the Bulldogs and well above their averages during the Brad Stevens era. Rather, it was Butler’s efficient offense, which registered 1.16 points per possession. Part of that was their three-point shooting (11-24, 48.1%) with Rotnei Clarke leading the way (5-11). We have come to expect that from Butler, which often relies on the three-point shot as a great equalizer. But the more surprising, and perhaps more significant, elements of Butler’s offense were its willingness to attack the basket and its prodigious output on the offensive glass. Sophomore wing Roosevelt Jones led the attack, often exploiting a favorable matchup against Jordan Hulls, en route to 16 points on 6-10 shooting (no threes). And the Bulldogs rebounded nearly half of their own misses — 48.7%. To some extent, the Bulldogs took advantage of sloppy block-outs by Indiana, but this reflects a season-long strength and a marked shift from the early years of Brad Stevens’ tenure. In Stevens’ first four seasons, Butler never averaged an offensive rebounding percentage of more than 32.8 percent. But last year, the Bulldogs hauled in 35 percent of their misses, and this year, it’s up to 39.4 percent. As impressive as Butler’s win was, VCU quietly made waves of its own this past week as they pummeled Alabama and Western Kentucky by a combined 51 points. In both games, VCU went for the kill early, jumping out to big leads on the strength of their Havoc defense. The Rams did not allow Alabama to score a field goal until 10:44 had elapsed, en route to a 33-18 halftime lead that they would convert into a 73-54 final score. Alabama finished the game with 18 turnovers — a season high, as it often is for teams facing VCU’s defensive pressure. Four days later, VCU suffered no letdown from its BCS beatdown, whipping on Western Kentucky, one of the Sun Belt’s top teams and last year’s Tournament participant. After jumping out to 15-3 lead, the Rams would head into halftime up 42-16, cruising the rest of the way to a 76-44 win. VCU forced a whopping 32 turnovers, including one on each of Western Kentucky’s first three possessions. The old Bulldogs may be learning new tricks while the Rams thrive on the tried-and-true, but regardless of how they’re doing it, both teams have vaulted themselves to the top of A-10 heap. Don’t take my word for it, ask the computers. Any of them — Butler and VCU are the A-10’s two highest ranking teams in the RPI, Sagarin ratings, and Pomeroy ratings. The A-10’s mainstays have not distinguished themselves. Temple was routed badly by Duke in its first real competitive game of the year and just lost to Canisius at home by 10 points; Xavier is trying to replace five starters; St. Louis is trying to get their feet under them after losing their coach and then their star point guard to injury; and St. Joe’s, UMass, and Dayton have struggled to find consistency. As a result, there is a good chance that the A-10 will crown a champion it has never crowned before.